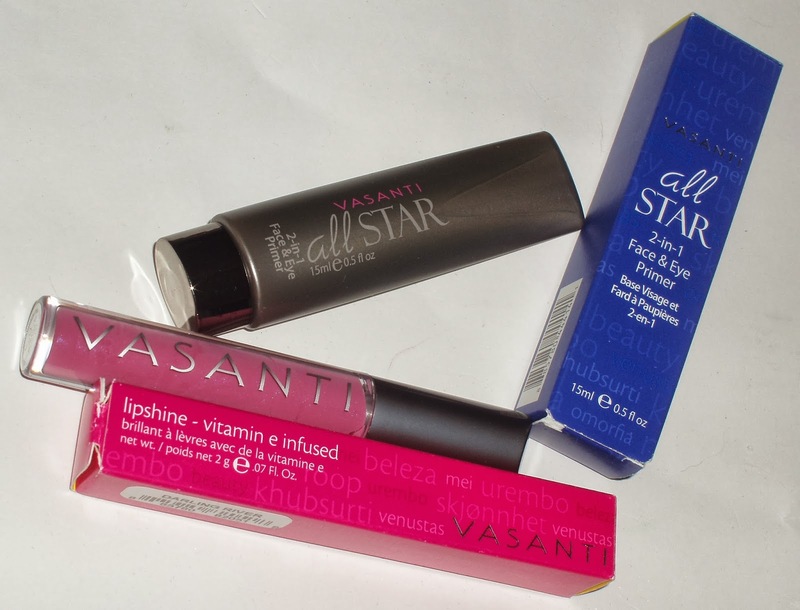 I had not been aware that Vasanti has made a primer called All Star 2-in-1 face and eye primer – the grey squeeze tube in a blue box. – blurs imperfections and fine lines with anti-aging ingredients. The product comes out of the tube like an off white lotion but becomes clear once rubbed in, almost s liquid-to-powder texture. It makes the skin feel smooth and a tiny bit sticky. I found the product works great on my lids, no creasing or fading of the eyeshadows for about 13 hours. Since it is translucent on, it does not improve the colour payoff of my eye products, which it does not claim to. On the face, it only keeps my liquid foundation and concealer on for about 8 hours. Of course I touch my face a lot more often than I do my eye lids, but still I think the primer works better with powders than liquids. I’ll keep using it only as my eye primer as that’s what it does best, but if your normal day does not go beyond 8 hours, All Star is a good primer for both purposes. For the tiny amount of product used on the face areas I want to use it at, I won’t count too much on the anti-aging effect. Ingredients: Isododecane, Cyclopentasiloxane, Polyethylene, Trimethylsiloxysilicate, Disteardimonium Hectorite, Bis-Diglyceryl Polyacyladipate-2, Trihydroxystearin, Hexyldecanol, VP/Eicosene Copolymer, Propylene Carbonate, Sorbitan Sesquioleate, Dimethicone, etc. All Star is paraben/ oil/ gluten free, retails $24 for 15ml/ 0.5oz (the size pictured) or $39 for 30ml/ 1oz. 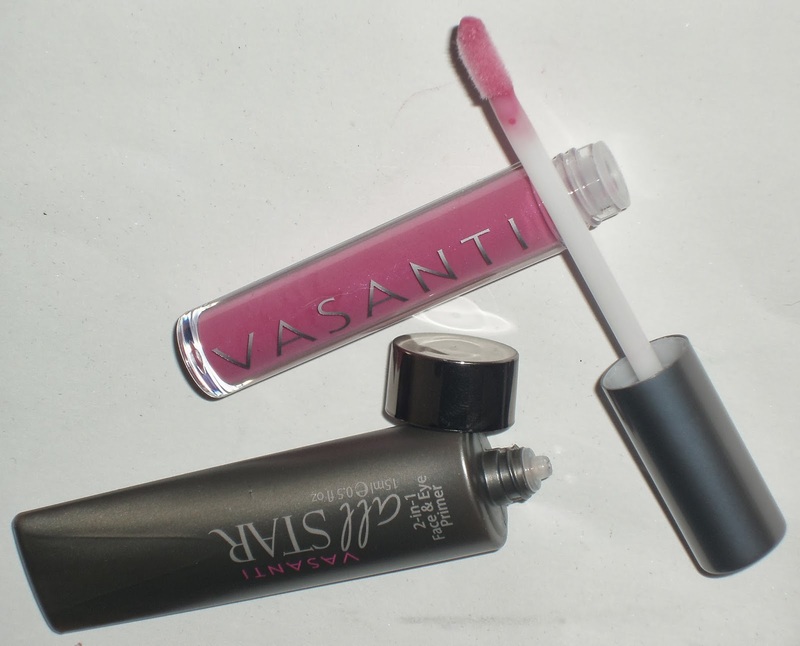 Then, there is Vasanti Vitamin E-infused Lipshine in Darling River, a mauvy pink with high shine but no shimmer. On top of my dark lips, Darling River appears as a YLBB (and more pink) colour, which makes it an everyday choice easily. 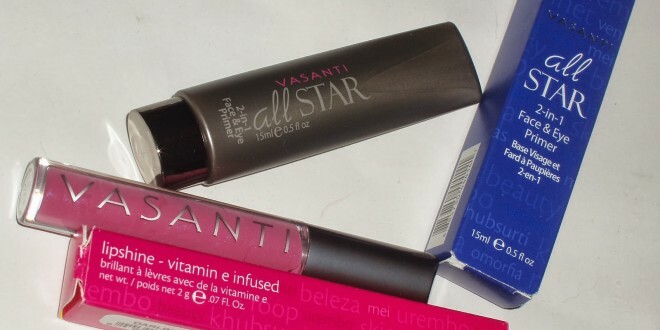 The gloss feels very comfortable on the lips and not drying at all. The claim to be wind and cake proof, besides being cute and funny, is quite true lol. My hair does not stick to my lips in the wind. And while I did not have any cake during the testing period, the gloss does last through breakfast most days. I still reapply for more colour and for that comfortable feeling it gives. 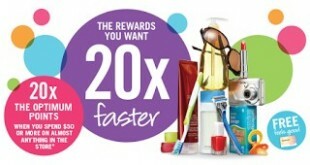 The gloss has no paraben, mineral oil, petrolatum, sulfates, GMO’s or Tricosan, retails $15 for 2g/ 0.7oz. 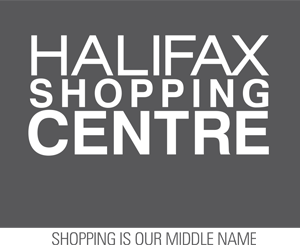 Check out other colours in the line too. 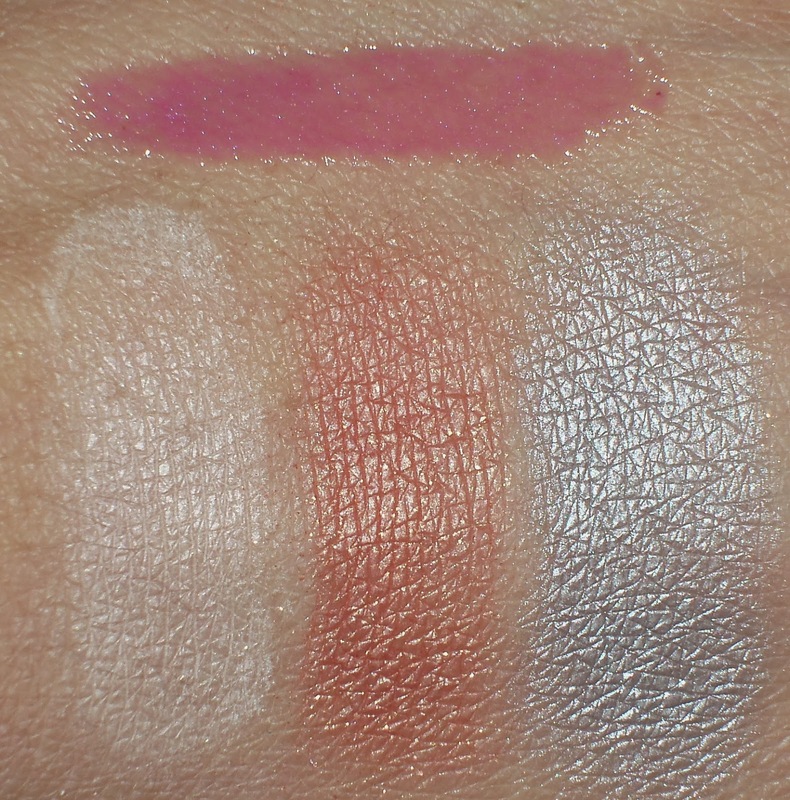 Below is the swatch of Darling River up top, then three NYX eyeshadows (see the FOTD to follow) over All Star (bottom half) and by themselves (top half), in different lighting. 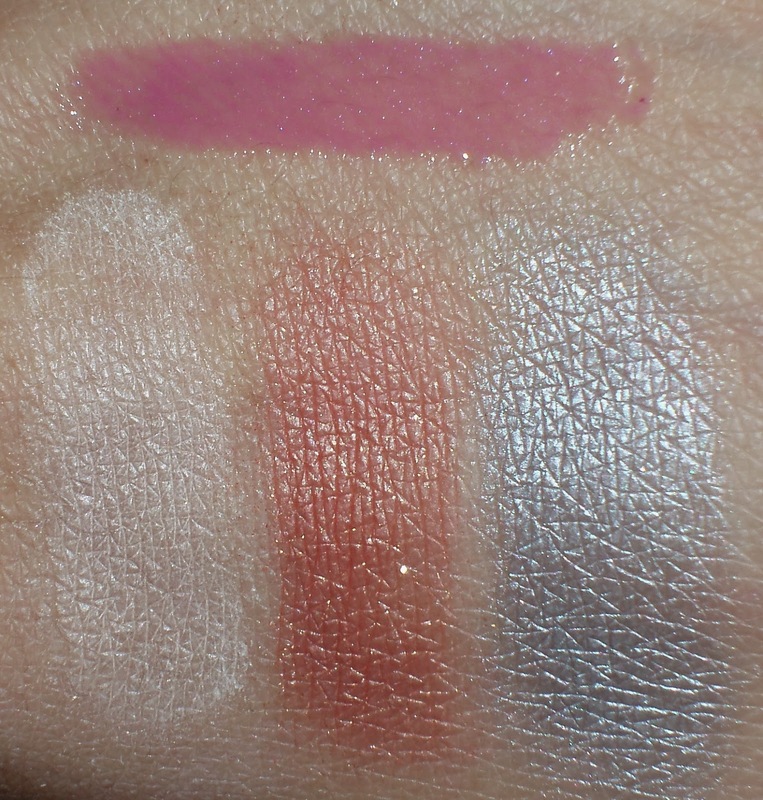 As I mentioned, All Star does not make the eyeshadows pop, so swatches don’t help much in this case but its staying powder stays true. And Darling River is semi sheer but is buildable to a beautiful pink. If you need more recommendations, I just picked up the staple Eye Wonder (eye cream), BrightenUp! Enzymatic face rejuvenator (facial scrub), and Sun Peached Glow brightening mineral powder (a light peach blush).